This Concise Encyclopedia draws its material from the award-winning Encyclopedia of Materials: Science and Technology, and includes updates and revisions not available in the original set. 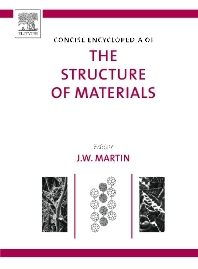 This customized collection of articles provides a handy reference for materials scientists and engineers with an interest in the structure of metals, polymers, ceramics and glasses, biomaterials, wood, paper, and liquid crystals. Materials science and engineering is concerned with the relationship between the properties and structure of materials. In this context "structure" may be defined on the atomic scale in the case of crystalline materials, on the molecular scale (in the case of polymers, for example), or on the microscopic scale. Each of these definitions has been applied in making the present selection of articles. FERROUS METALS AND ALLOYS Austenite Decomposition: Overall Kinetics. During Isothermal and Continuous Cooling. Transformation. Bainite. Cast Irons. Ferrous Alloys: Overview. Martensite. Pearlite. Precipitation from Austenite. Sheet Steel: Low Carbon. Stainless Steels: Cast. Stainless Steels: Duplex. Steels: Classifications. Tool and Die Steels. INTERMETALLIC MATERIALS Intermetallics: Crystal Structures. Intermetallics: Laves Phases. POLYMERS Block Copolymer Phase Behaviour. Block Copolymers, Structural Characterization of Ceramic-modified High Temperature Polymers. Clay-based Polymer Nanocomposites. Cyclic Polymers: Crystallinity of Cycloaliphatic Polymers. Fluorine-containing Polymers. High-temperature Stable Polymers. Hybrid Dendrimer Star-like Polymers. Injection Molded Semicrystalline. Polymers:Structure Development and Modeling. Polymer-ceramic Nanocomposites: Polymer. Overview. Polymer Crystallization: General Concepts of. Theory and Experiments. Polymer Spherulites. Polymer Surfaces: Structure. Structure of Polymer Glasses: Short Range Order. CERAMICS & GLASSES Binary Oxide Ceramics: Al2O3, ZrO2, Structure and Properties of. Chalcogenide Glasses Glass Ceramics. Nanoscale Ceramic Composites. Oxide Glasses. Oxynitride Glasses. Porous Ceramics including Fibrous Insulation, Structure and Properties. Portland Cements. Si3N4 Ceramics, Structure and Properties of. Si-AlON Ceramics, Structure and Properties of. BIOMATERIALS Bone Mineralization. Cuticle. Marine Teeth (and Mammal Teeth). Shell: Properties. Teeth: Structure/Mechanical Design Strategies. Tissue Engineering Scaffolds. WOOD and PAPER Paper: Porosity. Paper: Structure. Wood, Constituents of. Wood: Macroscopic Anatomy. Wood: Ultrastructure. LIQUID CRYSTALS Calamatic Liquid Crystals. Chiral Smectic Liquid Crystals. Cholesteric Liquid Crystals. Discotic Liquid Crystals. Liquid Crystal: Overview. Liquid Crystalline Polymers: An Introduction. Nematic Discotic Liquid Crystals. Polymeric Discotic Liquid Crystals.